FTR Teaser #3: Captain Crossbones! If you thought the FTR was lacking in undead pirates, fear no more! CAPTAIN CROSSBONES arrives from Pirate World on Brymstone, ready to strike fear into the hearts of his opponents! No one really knows if Captain Crossbones is truly undead or just an alien, but everyone agrees that he’s scary! 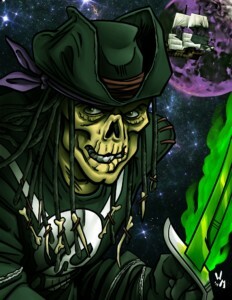 Captain Crossbones is created by FTR Madness winner Richie Newman. Scary good creation, Richie! Check back soon for another new promoter created FTR character! Preorder for FTR, along with the latest Legends of Wrestling and Ring of Honor sets is this Friday November 24th! Shipping starts December 12th! ← Jim Cornette is Out to Stir Up Trouble in Legends!